soundcloud helper is not a classical bot. 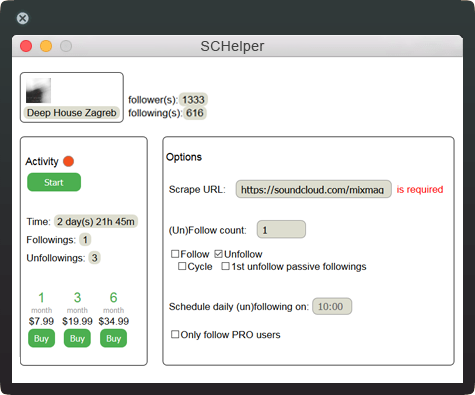 It automates the job you would normally do on SoundCloud to gain more exposure; follow and unfollow users. The app follows a set amount of followers from a user of your choosing. The daily number of actions (followings and unfollowings) that is recommended on SoundCloud is 100-250. It can follow the set number of users immediately or on a daily schedule. So if you are in a cycle of gathering followers on SoundCloud, you don't have to worry about setting your alarm to follow or unfollow 100 users every day manually, you just tell the app to follow or unfollow on a daily basis and that's it. Voila. No more manually running bots everyday, your actions are scheduled on a daily basis. You just set the app and watch your account grow. You can also use Cycle option to switch between follow and unfollow modes automatically for completely unmaintained operation. The app automatically remembers the users that you have followed and puts them into a database, so they don't get followed again in a new cycle. If you have already followed users on your account, and first want to unfollow these, the app will (also) automatically put these existing users in the database so they don't get followed again. Unestablished artists usually gain 600 new organic followers, and assorted plays, likes and other actions with just the one 3-month subscription! With an established artist, these numbers greatly increase! The price for a 3-month subscription is 14.99$. Inside the app we also offer a 6-month subscription for only 27.99$. That comes out to a very affordable figure of only ~4.50$ per month! You can choose to cancel your recurring subscription anytime. The whole process is very automated and transparent. What sets us apart from other apps of this kind is a different approach; you just schedule the app and it does everything automatically. No more manually running desktop bot applications each and every day. 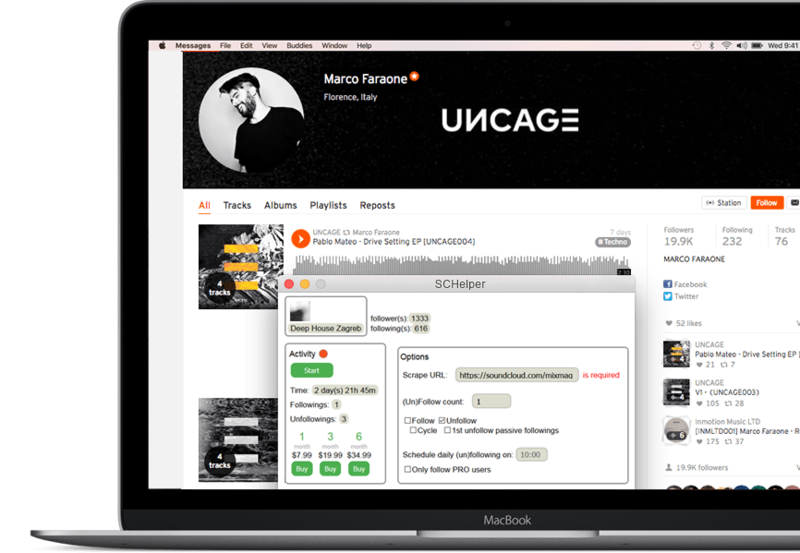 Think of SoundCloud Helper as Instagress for SoundCloud. Number two, we won’t boost your stats artificially, however your will see a boost in your stats, all organic! Thirdly, this is a web-app. The app also has an option to follow only Pro (more precisely, all non free) users which is very helpful. And lastly you won't follow the same user twice when doing more than one cycle of follows or unfollows. It is also very minimalistic and very efficient. Gain 600 new organic followers with only one 3-month subscription! How many SoundCloud actions (follows & unfollows) are allowed per day? 95 follows per day. For unfollows you can go a bit higher. How much money will updates cost? Updates are free for the lifetime of the product. What are the user requirements for SoundCloud Helper? SCH is a web-app. You can use it with any desktop (macOS, PC, Linux) or mobile platform. How do I login with my credentials? You will receive your credentials after purchase. You will receive two e-mails, one with your credentials and one with a receipt. Please also check your junk and spam folders, since one of the messages could go there, while one might go to your regular inbox. Can I cancel my subscription after three months? Of course, if three months of activity is enough for you, you can choose not to extend your subscription. Can I follow only PRO (or non-free) users? Where do I get support for the app? You can use the support form here, or e-mail us directly here. Please do not send big attachments or spam here since these will be deleted. Can I use multiple SoundCloud accounts? Yes. Connecting multiple accounts is possible from inside the app. You can purchase subscriptions for any additional accounts you want. We also offer bulk discounts. Contact us for more info. How many new followers can I gain with a three month subscription? Depending on the settings in the app, and your artist profile you could expect 600 new followers plus assorted plays, likes etc. each three months. For established artists this number greatly increases! You have already paid for the given email.